If it's January and there's a lioness in town, then it must be time for Monaco's famous Festival of Circus. We'd probably all rather see beautiful animals like this roaming the wilds of Africa but I have to say the lionesses were rolling around playing like kittens. When I arrived, three were outside in an enormous run and the rest were being organised to go into the circus tent for a rehearsal - maybe half a dozen lionesses, a lion and a tiger. Whilst they were gone, the three in the run were jumping up and down every time they heard their owner's voice. You have to be patient when taking their photo. Mostly they turn their backs on you - can't blame them. 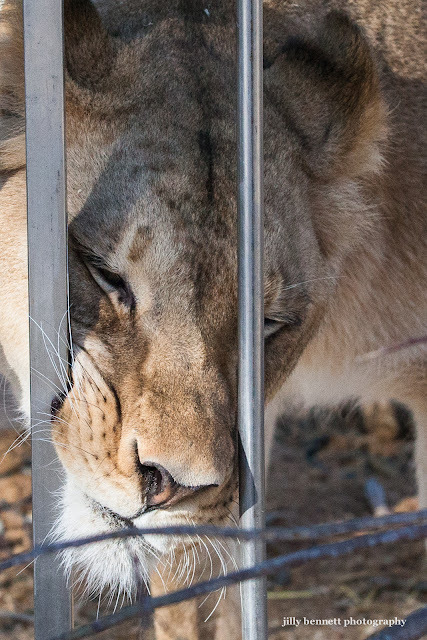 But I waited and waited and eventually this beauty came up and said Hello and rubbed her gorgeous face against the bars. If you want to see wonderful photos of lions in the wild, see my friend Maggie Calkins' Facebook photo. Her fur looks so very soft, inviting touching; however, I think I would resist the temptation.